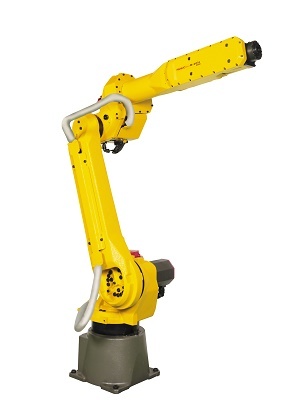 FANUC Robotics UK has enlarged its M20-iA family of is based on the same kinematics and engineering as the existing M20-iA/10M and M20-iA/20M robots, but with enhanced payload that broadens its application envelope, making it an attractive investment proposition. The M20-iA/35M can be fitted with a multi-purpose gripper for high speed pick and placing and for those applications that require reach and multi-tasking ability. Working alongside a tray loading system, the M20-iA/35M can pick retail packs out of a tray and place them onto a moving conveyor for recirculation. The same M20-iA/35M can also palletise full boxes, demonstrating the efficiency benefits that can be realised by using the same robot to carry out both pick and place and palletising duties. Capable of completing 25 cycles per minute, the M20-iA/35M offers industry leading axes speed. The robot’s generous payload also opens up possibilities for handling several items simultaneously to double or even triple throughput, if required. Like the other two robots in the M20-iA series, the M20-iA/35M is compact in size, with a slim wrist, allowing it to work within the space constraints that are often found in food manufacturing facilities. For maximum installation flexibility it can be floor, angle, wall or ceiling mounted. The robot also features the same hollow upper arm and wrist that was engineered by FANUC as the solution to dressout issues. The unique design allows utilities to be neatly contained within the arm, eliminating snagging, tearing and rubbing and the subsequent downtime. As with all FANUC robots, the M20-iA/35M is enabled to take full advantage of FANUC’s iRVision cameras for product location, recognition and inspection, in addition to barcode reading and line tracking.